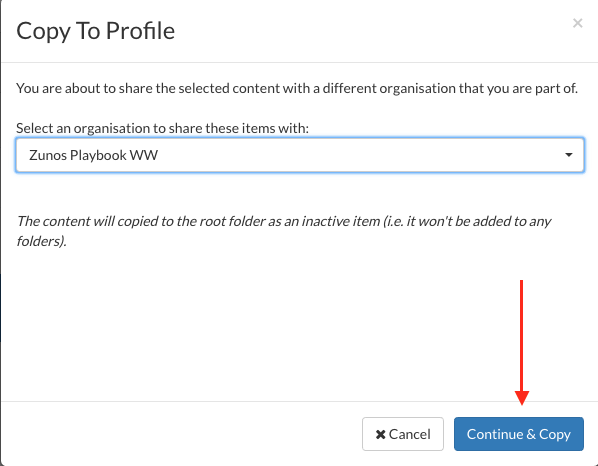 Learn how to copy content to new folders and to related profiles in Zunos. This feature will only appear for those admins who have more than one account linked to their user profile. It will make a copy of the content for the account that you are sharing the file with. If the content is edited or deleted in one account, this will not affect the other account. In the admin portal right click the piece of content or open the options of the folder you wish to copy. And from the drop-down list, select Copy to a different profile. A pop up box will appear with a dropdown list of all your accounts. Choose the account you wish to copy the content into and click Continue and Copy to proceed. The copied content folder and files will appear in the Live Content area of the new account.